Ba scríbhneoir as Londain, Sasana í Mary Wollstonecraft (27 Aibreán 1759 - 10 Meán Fómhair 1797) ag deireadh an 18ú haois. Feimineach neamhleithscéalach ab ea í. Tá clú an fheiminigh uirthi inniu ach bhí a cáil amuigh mar bhean de chineál eile ar fad ag an am. Ar feadh 1786-1787, bhí Wollstonecraft ina cónaí i mBaile Átha Cliath (15 Cearnóg Mhuirfean) ar feadh tamaill agus chaith sí seal ag obair i gCaisleán Bhaile Mhistéala. D'éirigh sí ina réabhlóidí ag an am sin. is cosúil. Chinn sí bheith ina údar agus bhog sí go dtí Londain, agus ansin Páras. Bhí Wollstonecraft an-tógtha leis an bhfeimineachas roimh ré. Scríobh sí an leabhar clúiteach faoi chearta na mban, A Vindication of the Rights of Woman, i 1792. B'ait le daoine feimineach ag an am, fiú sa Fhrainc. Scríobh Wollstonecraft an leabhar, An Historical and Moral View of the French Revolution, i bPáras. Níor chaith Wollstonecraft ach 9 mbliana ag scríobh. Agus í ag tabhairt linbh ar an saol, fuair Wollstonecraft bás coicís níos déanaí. Saolaíodh iníon di, Mary Wollstonecraft Shelley, údar Frankenstein. Is de shuimiúlacht gurbh í Mary Wollstonecraft is géire a shonraigh an ceangal idir sclábhaíocht na mban agus sclábhaíocht na tíre faoi rí uilechumhachtach, ach gurb iad na mná is túisce a íslíonn agus a tháiríonn iad féin i láthair na mórgachta ríoga, a scríobh Alan Titley. 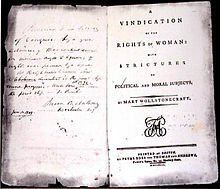 Meatacht intleachtúil a thug a fear céile William Godwin ar an lúitéis náireach seo, nuair a d'fhoilsigh sé beathaisnéis faoi Wollstonecraft, Memoirs of the Author of A Vindication of the Rights of Woman (1798). Tugadh an leathanach seo cothrom le dáta an 10 Meán Fómhair 2017 ag 18:33.